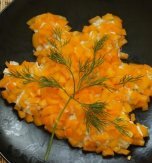 Love chicken and mushroom dishes but tired of traditional salads? This dish can bring a fresh note. 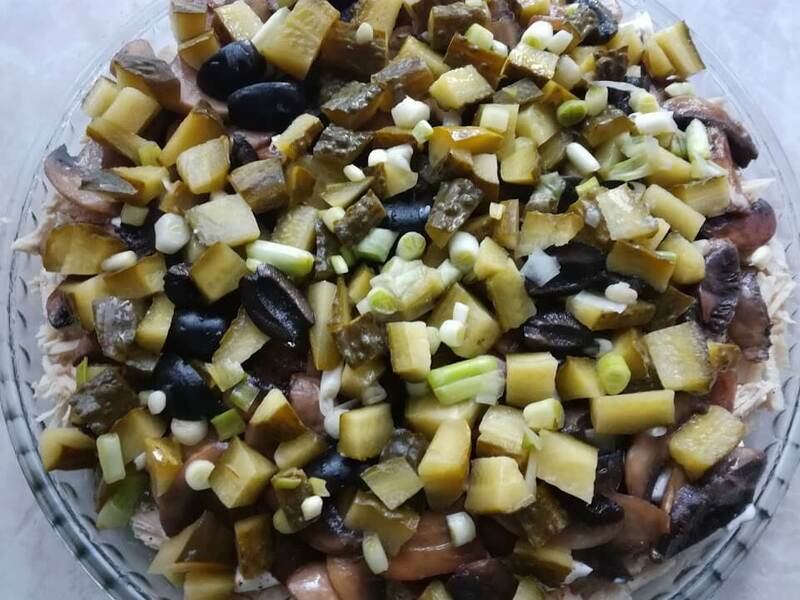 It is made with layers of chicken, mushrooms, cucumbers, black olives, eggs, and topped with hard cheese. 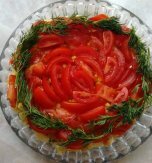 However, what makes this dish really distinctive is the way of serving. 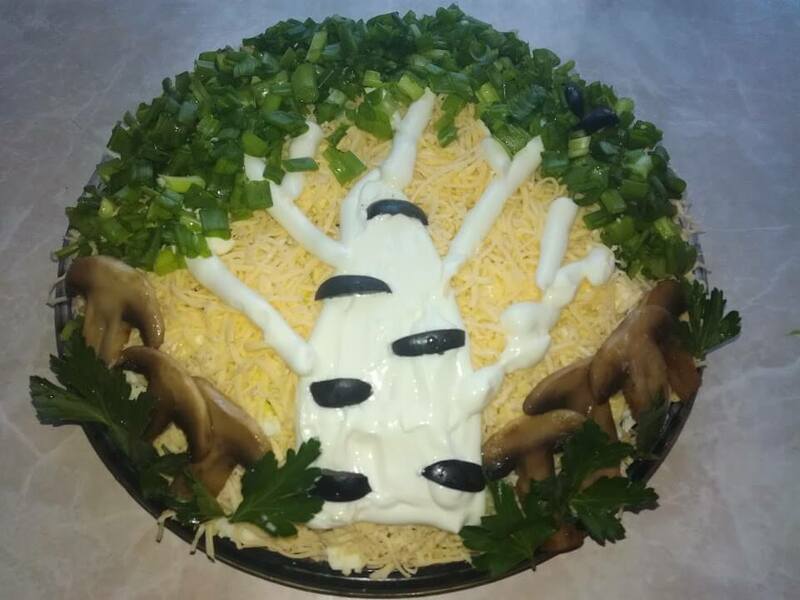 We are going to decorate this chicken mushroom salad as a silver birch. So, it not only tastes great but also looks special. Serve it for some festive occasion and surprise all your guests! 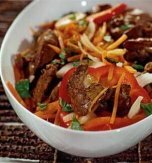 This salad can also be cooked with prunes and nuts. If you are a big fan of prunes, add to the salad one more layer of prunes with nuts. It’s better to buy big champignons since we’ll need them for decoration. Peel and wash champignons. Slice the mushrooms. Preheat vegetable oil in a skillet. Put the champignon slices in one layer (in that case the mushrooms will not release juice). Salt the champignons and golden brown them. Then transfer the mushrooms to a plate covered with a paper tissue to let the oil drain out. Repeat the procedure till you fry all the champignons. Let them cool. Put aside the most beautiful slices of mushrooms (we’ll use them for decoration). Wash the chicken breast and boil it in salted water. Cool and shred the meat. Arrange it on a serving plate and grease with mayonnaise. Season the chicken with black and red pepper. Put the fried mushrooms above. Then slice black olives and pickled cucumbers. 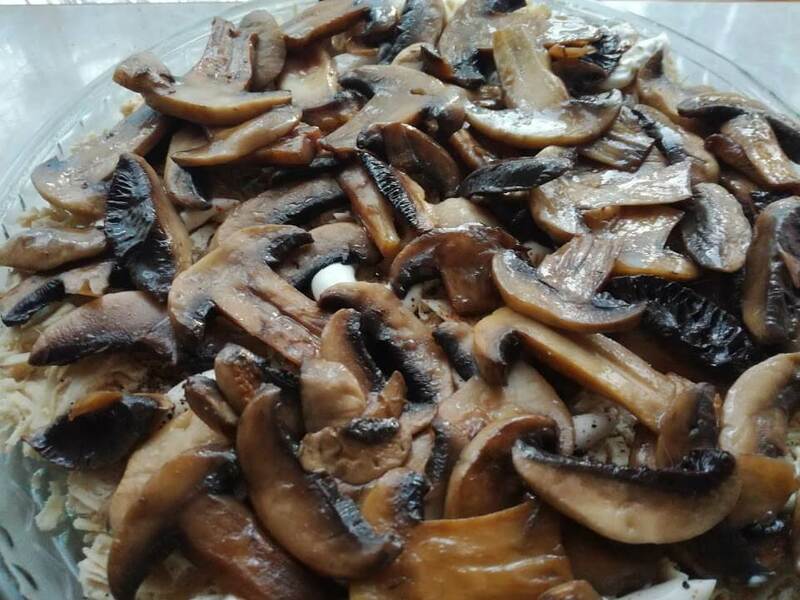 Combine the ingredients and place above the champignons. Wash spring onions and cut it into little circles. Top the salad (leave some spring onions for decoration). Hard boil and peel eggs. Grate them finely. Arrange the eggs above the salad and grease them with mayonnaise. 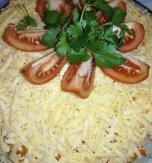 Grate cheese finely. Top the salad with the cheese. 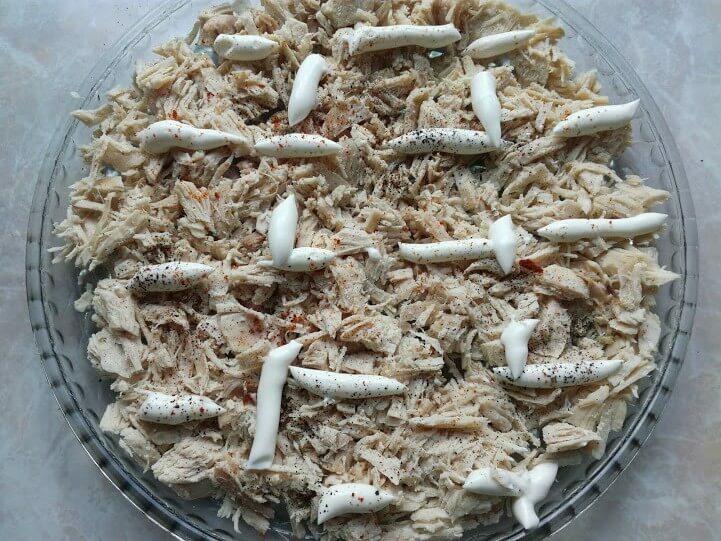 Now we’ll decorate the upper layer of our layered chicken salad. Paint the stem of our birch with the help of mayonnaise. Then make tree twigs. Slice black olives thinly and put them above the stem. Add the spring onions. Put the champignons and parsley twigs at the foot of the birch. 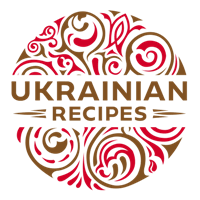 Do you have a favorite Ukrainian recipe for a chicken mushroom salad with cucumbers? If so, please let us know in the comments below or write us an e-mail.